The Izzo family is relatively new to NC and we bravely ventured to Chapel Hill on an afternoon of a football game for a holiday mini session. No tough parallel parking or mud or construction could stop this intrepid family! It was a beautiful seasonal day - colorful and cool - but the Izzos just exuded warmth the whole time. From hugging and smiling to cheering on their little one as he warmed up to the camera, this family casts a glow everywhere they go! Welcoming a new generation to the family is a celebration - full of casseroles and happy grandparents and warm congratulations. It means cuddling on the couch and learning a whole new approach to the day as everything changes to revolve around that new tiny being that fills your life with the deepest love. And when you’re surrounded by a family as big and as loving as the Jacksons, that warmth spills over - in your smile, in your voice, in the light of your eyes. Welcome to the world, little boy, and congratulations to the Jackson family! The holidays are coming up! So who spent their weekend breaking out their decorations?? We brought out a few for this session to make some fun seasonal photos. 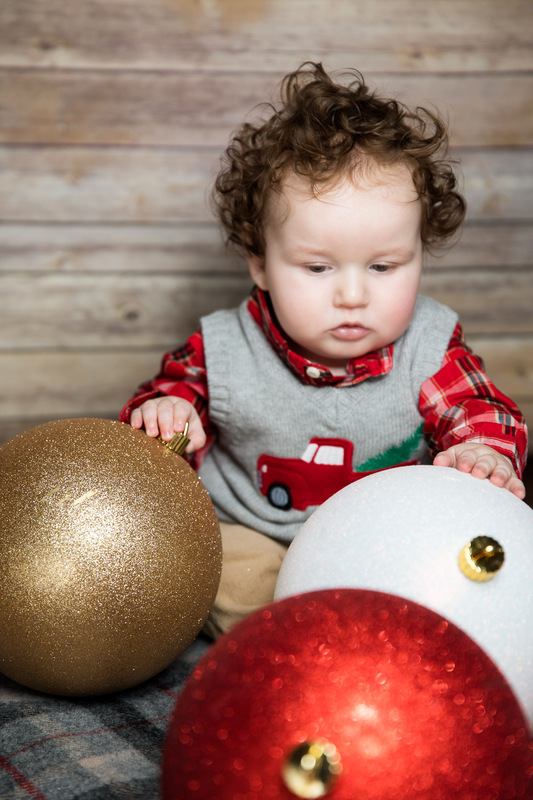 For this baby milestone photo session we started with some simple sitting shots and oh gosh did this little boy give us so many cute expressions! 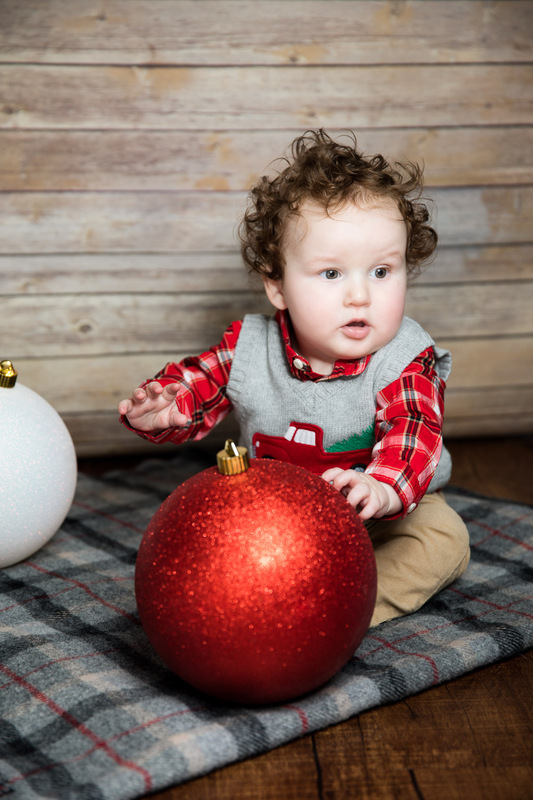 Then we brought out a few oversized holiday ornaments for him to play with. Even when he didn’t like one of the poses or when he got distracted by the glittery balls he was just so cute! And of course his best fur friend had to get in on the action. Hooray for the holidays! And check out the highlights! I don’t know about you but I am smitten with this little cutie! The Krouse family are celebrating their first holiday season with their little boy and he was all smiles for our mini session. Curious, cheerful, and charming, he was such a delight to photograph on an early morning! I love love love how the McGinn-Sadler family is always up for a new adventure and when they said they wanted a fun option for their holiday photos I knew just the spot! The Morgan Monsters wall near Trophy Brewing is an outdoor mural by Kevin Lyons, whose work has been exhibited globally and who has created products and designs with Nike, Converse, Cotopaxi, and more. It was a great spot for this cool and hip family with their little boy who OMG IS GROWING UP SO QUICKLY! Happy holidays, everyone! I hope if you celebrate this season your respective holidays were fabulous and that you're looking forward to the new year! I'm pretty excited to wrap up the holidays and to have several days of downtime for planning for the new year. Of course, wrapping up the holidays means going through recent photos from October and November mini sessions - like this super fun session with my good friends Britt and Cliff and their foxy little furbaby Bailey! Enjoy, and happy holidays!